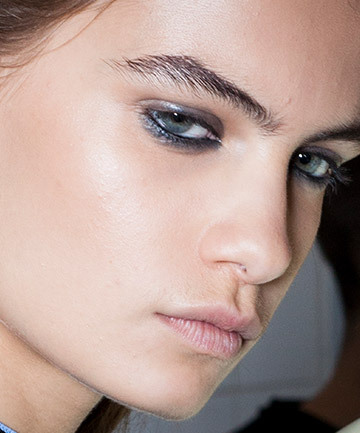 News alert: Brows are having a major moment. OK, to be fair, maybe that's not breaking news, since the focus has been on brows for quite some time now. But the latest take on the trend eschews those supersculpted "brows on fleek" that once flooded your Insta feed. Enhancing your arches is now all about keeping them looking soft and naturally full. The easiest way to do so? Two words: brow powders. "They're a great option if you prefer full, feathery brows with believable definition," explains pro makeup artist and beauty educator, Jo Levy. "They won't dry as quickly as a gel, and don't go on as heavily as a pencil, making them goof-proof." Plus, you can use them throughout the entire brow, or just to touch-up sparser areas, Levy adds. For the best results, Levy suggests using a flat brush (picture the kind you'd use for liner) and applying the powder in short, even strokes. Finish by brushing through with a clean spoolie to lift off any excess powder and blend everything together. Now that you've nailed the technique, all that's missing is the right brow powder. Lucky for you, we've rounded up 10 of the latest and greatest.